• Air Quality Amendment Act, 20 of 2014.
a Certificate of Registration (COR 046) issued by the National Nuclear Regulator. 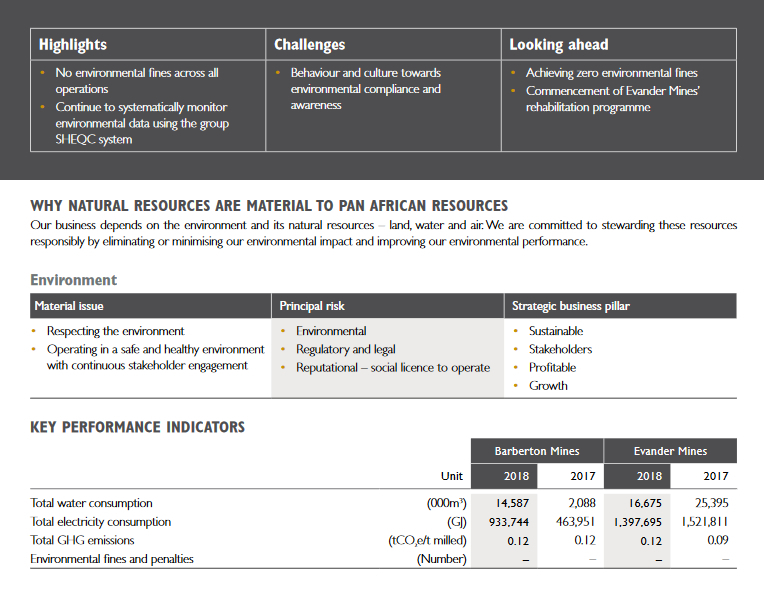 The group’s operations have implemented a group environmental management system, which aligns to ISO14001. Environmental impact assessments are conducted at all operations with impact and aspect registers available for each operation. These are reviewed annually to ensure legislative compliance. Risk registers are reviewed quarterly and reported to the group SHEQC manager, who elevates any material issues to the SHEQC sub-committee. All operations have assessed the environmental risk associated with the transport of goods and materials and found no significant environmental impact. Any cyanide transported to Barberton Mines and Evander Mines is delivered by a supplier-approved transporter. Emergency response trailers are stationed on site at Barberton Mines, BTRP and Evander Mines to deal with spillages. system. Water quality in the areas surrounding operations is monitored and managed rigorously. Surrounding surface and groundwater are monitored to prevent polluted water being discharged. The discharge of water by our operations, through controlled releases into the environment, is predetermined through regulatory requirements and is in line with our water-use licences. No environmental fines were issued. 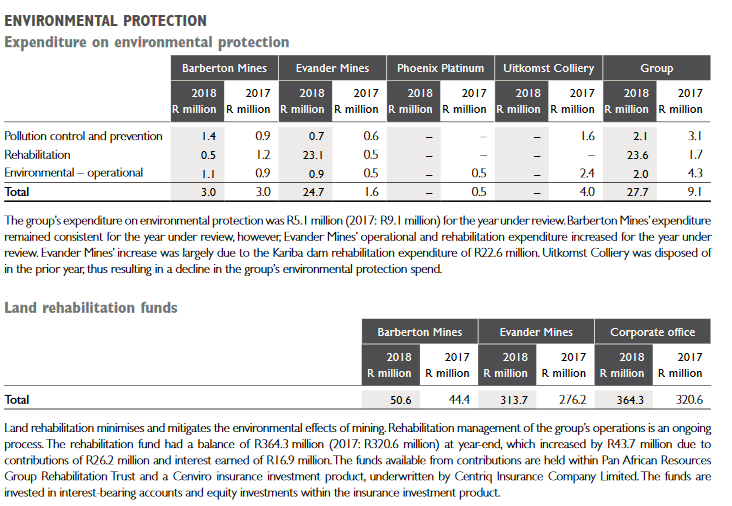 Two environmental incidents were reported at Barberton Mines and five environmental incidents were reported at Evander Mines during the year under review.Barberton Mines’ amended Environmental Management Plan (EMP) was approved by the DMR in August 2017. The DMR approved Evander Mines’ amended EMP in September 2013 and its water-use licence (including Elikhulu) in August 2017. Environmental awareness training is conducted at group operations during induction, and refresher training is provided when employees return from leave. In addition, monthly awareness training focuses on specific environmental topics. Due to behaviour and culture challenges experienced across operations, the group will focus on reinforcing an employee culture shift towards environmental awareness and accountability. Energy management is based on energy efficiency and climate change, which aligns to the group SHEQC policy. This is driven by the need to reduce energy consumption and greenhouse gas (GHG) emissions and includes promoting energy efficiencies at the group’s operations. Emissions at all operations are closely monitored and tracked. 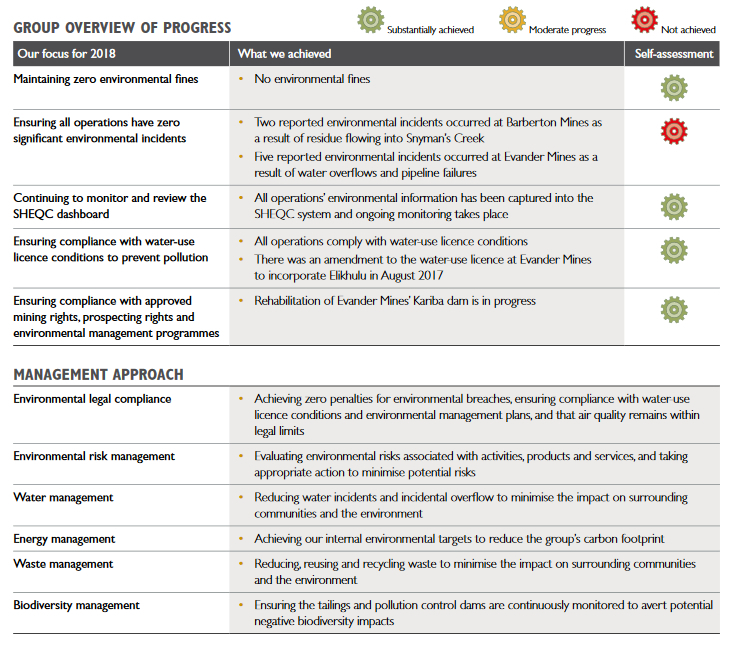 The group applied the GHG Protocol and emissions factors published by Eskom to establish direct and indirect emissions. Waste at operations is managed in line with the group SHEQC policy and the legal requirements of the National Environmental Waste Act, 59 of 2008 and the National Waste Management Strategy. All operations apply the 3Rs principle – reduce, reuse and recycle – to minimise the impact of waste production on community health and the environment. Internal audits ensure compliance with internal procedures. All waste is disposed of responsibly and sent for recycling where applicable. Waste disposal suppliers are appropriately certified.Operational waste includes mineral and non-mineral waste. Mineral waste, e.g. waste rock, is mostly waste generated from gold production, while non-mineral waste is generated from processing operations and produced in smaller volumes than mineral waste. This non-mineral waste, e.g. plastics, steel, paper and timber, is managed by recycling, reuse, offsite treatments, and disposal or on-site landfills. The group’s operations ensure responsible storage, treatments and disposal of non-mineral waste in an environmentally responsible way. The group uses material safety data sheets to identify and manage potentially hazardous materials and waste. There were no significant spills at any of the operations during the year.